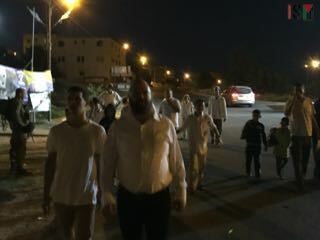 Last night, a group of about two dozen Israeli settlers trespassed on private Palestinian land in al-Khalil (Hebron), protected by the Israeli police. 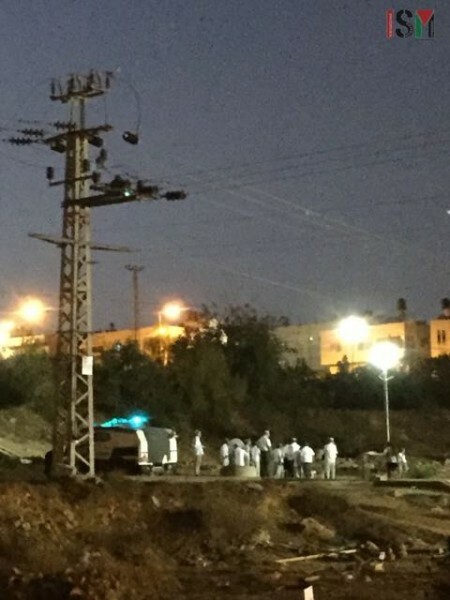 Firday evenening, a group of about two dozen settlers from the illegal settlement of Kiryat Arba again came to private Palestinian land situated right opposite the entrance to the illegal settlement to pray. In the past, settlers have built a synagogue on this land that was demolished in April this year, after an Israeli court ruled that they had no right to build on this land owned by a Palestinian family. Since the demolition, settlers have repeatedly attacked the Palestinian families living in this neighbourhood. Now, the piece of land has been declared a closed military zone, denying the family access to their own land, even though an Israeli court ruled that the land belongs to them. As the land is a closed military zone, settlers are forbidden from entering, yet Israeli police forces were present and protective of Israeli settlers trespassing on the land. International human rights observers documenting the illegal use of this land were accosted and threatened by the group of settlers as they left the area.